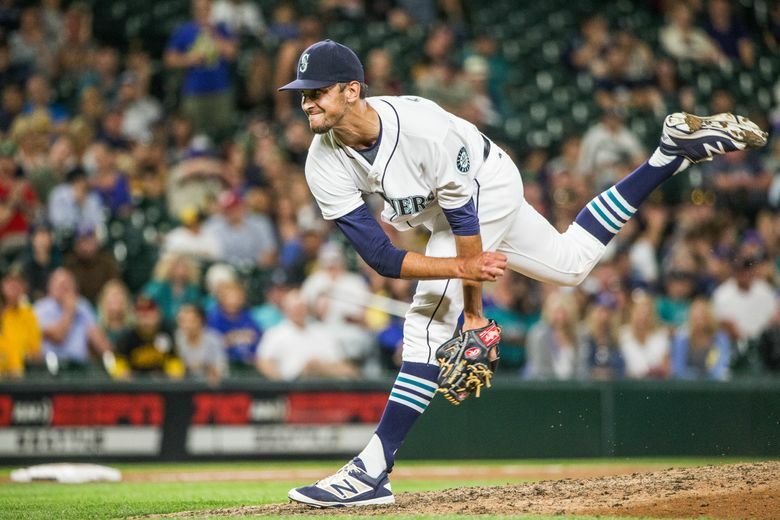 Steve Cishek is no longer the Mariners' closer, but he isn't going to let that change who he is as a teammate. It's why he helped shower Edwin Diaz with Gatorade after his first career save on Monday night. In the moments after he had notched his first career save, having officially taken over the closer duties, Edwin Diaz stood in the dugout at Safeco Field doing a walk-off interview with Root Sports following the Mariners’ stunning 5-4 win over the Red Sox on Tuesday night. In the midst of the interview, Diaz received a celebratory dousing from a full jug of Gatorade to commemorate his accomplishment. The people responsible for the shower were Tom Wilhelmsen, a one-time closer for the Mariners, and Steve Cishek, who lost his job as closer to Diaz just the day before. It may have been surprising for fans to see Cishek as part of the celebration given what had transpired, but it wasn’t to those who know him as a teammate. With Diaz hanging around for the interview, Wilhelmsen brought up the idea of the Gatorade bath. The relievers agreed it was a good plan and he and Cishek headed for the two jugs in the middle of the dugout. While players compete for spots and roles on teams, the bigger of goal of team success sits above all else, at least to Cishek. And the bullpen unit is a separate, tighter entity within the team. Cishek’s struggles have been well documented. He has blown six saves this year and his last two outings were soul-crushing defeats. He lost a 6-3 lead to the Cubs on the nationally televised game on ESPN on Sunday night. It included an awful wild pitch that tied the score. A night later, he gave up the go-ahead home run in a 2-1 loss to the Red Sox. The failures were well publicized as well as losing his closing job. It led to plenty of texts from friends and a few former teammates offering encouragement. It’s why he plans on sending his former Marlins teammate A.J. Ramos a text message very soon. On Wednesday afternoon, Ramos, the Miami closer, blew a 4-2 lead in the ninth at Wrigley Field, uncorking a wild pitch that scored the game-winning run. As teammates and coaches point out, “Cishek gets it.” He’s been around long enough to know what is expected. It’s why he’s standing at his locker postgame, waiting to address the media any time he’s blown a save or struggled. It’s part of the job as a late-inning reliever when you fail – be accountable. He learned it during his time in Miami where he went from successful closer to demoted closer and then traded away. Part of that job is to pitch. And Cishek is ready to return to the mound in his new role in middle relief. Diaz struck out three batters in his first save on Tuesday night, giving him 52 strikeouts on the season. According to the Elias Sports Bureau, Diaz reaching 50 strikeouts in 25 1/3 innings pitched makes him the fastest pitcher to 50 career strikeouts in their Major League debut season since 1893. Shortstop Ketel Marte (mononucleosis) and reliever Nick Vincent (upper back strain) are slated for rehab stints with Short-season Everett this weekend with Class AAA Tacoma on the road. Vincent is slated to pitch one inning on Friday night. Marte will need a handful of games to get his timing back. Vincent is expected to need at least two outings. The Mariners honored David Ortiz before Wednesday’s game. Edgar Martinez presented Oritz with a framed copy of his first professional contract, which he signed as a 16-year-old with Seattle. There was also of young Ortiz in the Mariners’ minor league system. Ortiz also received 34 pounds of King Salmon from Pike Place Market. Besides the team gifts, Nelson Cruz, Felix Hernandez and Robinson Cano – all wearing clocks on chains around their necks and big glasses – presented Ortiz similar accessories, a watch and artwork of Ortiz celebrating a homer. 1979 – The Mariners defeated Matt Keough and the Oakland A’s 1-0 on only three hits. The loss was Keough’s 13th straight, and 17th in a row over two seasons. Floyd Bannister pitched the complete game shutout for the Mariners. 1992 – Edgar Martinez is named A.L. Player of the Month for July after batting .388 with 3 HR and 12 RBI in 25 games. He took over the league lead in batting average on July 31 and never trailed after. 1995 – Mike Blowers hits his fourth career grand slam and Andy Benes outpitches Angels’ new acquisition Jim Abbott for a 10-7 Mariner win. 2002 – In just the first four innings, Edgar Martinez ties the major league record for sacrifice flies in a game with three. The Mariners’ designated hitter becomes the 11th player in history to accomplish the feat doing it in his first three at-bats in Seattle’s 12-4 victory over the Indians. 2011 – Charlie Furbush made his first start as a Mariner, allowing 2 hits and 1 run in 5.0 innings. He retired the first 13 batters he faced until giving up a double to Conor Jackson in the top of the 5th inning. The Mariners beat the A’s 7-4 to complete a 3-game sweep, their first at Safeco Field since June 2010 vs. the Reds. 2012 – Mariners had their season-high 7-game winning streak snapped in a 6-3 loss at New York behind a CG effort by LHP CC Sabathia. 2014 – Nick Markakis hit a leadoff home run for the Baltimore Orioles that stood as the only run of the game in a 1-0 win over the Mariners. Hisashi Iwakuma allowed 5 hits and 1 run in 7.2 innings to record the loss. First time in club history to lose 1-0 on a leadoff home run, and 9th time to lose in a 1-0 game where only run came on a solo home run. 2015 – The Mariners allowed 18 hits but still managed to hang on for an 8-7 win over the Rockies in Denver…the Mariners did most of their damage early including back-to-back home runs by Kyle Seager and Nelson Cruz in the 2nd inning…Cruz’ home run was his 30th of the season and his 4th in as many games…both finished by going 3-for-4 in the game, as did Brad Miller, who also homered in the game. Those have been updated from earlier today. Paxton had originally been slotted in as the Saturday starter, but with Walker feeling well and throwing a bullpen earlier today, he will move into the Saturday spot. Mirando isn’t expected to remain in the rotation. Veteran lefty Wade LeBlanc will likely start on Tuesday vs. the Tigers. Hisashi Iwakuma has been slated to start on Monday to remain on normal rest. Miranda will likely shift to the bullpen to give Seattle a second left-handed pitcher. That likely means that Donn Roach or Cody Martin will be optioned back to Tacoma to make room for Miranda.